2015 ADAP News August 20.pdf Stories include: ADAP’s FY16 Advocacy Goals to be Introduced at its Upcoming Annual Meeting, ADA at 25: The celebrations are over; the work continues, Services for Alabamians with Traumatic Brain Injuries (TBI), Are you Prepared for the Worst? 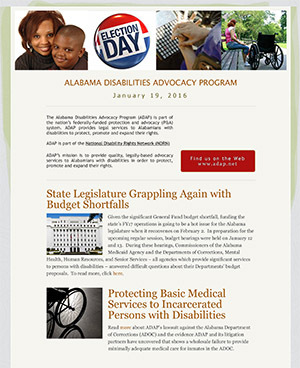 ﻿2015 ADAP News January 15.pdf ﻿Stories include: ADAP Advisory Council – January 30, 2015, Disability Leadership Coalition of Alabama appoints Executive Director, Arise Policy Conference - February 5, 2015, How the ABLE Act of 2014 Could Affect You. 2014 ADAP News November 14.pdf Stories include: Public Comment Sought for Medicaid ID Waiver,Test Your Know-How The Role of the Regular Education Teacher in the IEP Process, Attention Families-We Need Your Help! ﻿2014 ADAP News March 6 - IEP Training.pdf﻿ IEP Transition Trainings: Just in Time for Spring IEP Season! 2013 ADAP News July 15.pdf Stories include: Alabama Disabilities Advocacy Program Public Meeting to Set Advocacy Objectives for FY 2014, Employment First In Alabama –The Next Step, Protection and Advocacy for Beneficiaries of Social Security (PABSS), Voter Training in Mobile, Will Your Voice Be Heard On Election Day? 2013 ADAP News July 5.pdf Stories include: Week of Action on Amtrak for the 23rd Anniversary of the Americans with Disabilities Act! 2013 ADAP News April 24 - Employment First In Alabama.pdf “EMPLOYMENT FIRST” IN ALABAMA! 2013 ADAP News April 5.pdf Election Day! 2012 ADAP News October 12.pdf Stories include: ADAP needs your help, Students with Diabetes, Assistive Technology, KNOW YOUR RIGHTS forums, Assistive Technology (AT) Survey for Parents, Have Presentation. Will Travel. 2012 ADAP News September 12 - Voters face difficult choice.pdf Stories include: Voters face difficult choice on Sept. 18th - Should Alabama access its state saving account or risk massive funding cuts for Medicaid, prisons and other public services? September 2010 Stories include: Against Their Will, Another Exciting Season - TBI, The American Diabetes Association - Safe at School, Community Access Team: Change is good, Social Work Interns: Braughton, Shepard, Adamson, Planning for the Future: Take Control Now, 2010 Disability Conference. July 2010 Stories include: Alabama Disability Summit: 20th Anniversary Celebration of the Americans with Disability Act (ADA), National Park Service offers Free "Access Pass" to People with Disabilities, Assistive Technology, What is New about Health Care, " May I Help You?" Part 3 in a 3 Part Series on Title III of the ADA, Effective Communications and Law Enforcement, Protecting Institutionalized Youth from Abuse and Neglect, Planning Underway for 2010-11, ADAP priorities 2009-2011, My time at ADAP, Katie Gramling, ACDD Public Forums,ACDD Innovative Ideas grant Request for Proposal (RFP), Mark your calendar! - Self determination Summit on Quality of Life. May 2010 Stories include: Accessible Gardening, "We don't serve your kind here" - Part 2 in a 3 part series on Title III of the ADA, A New Start - A Parent's successful advocacy story - Sean Thomas story, Parent Advocacy Tips, Standing Strong by Mallory Parton, Moving to the Community, Psych 21 Training, Alabama Family Ties Training. January 2010 Stories include: First Anniversary of ADAP in South Alabama, Bryce Hospital to be Relocated, Is Everyone an Advocate, Who's New at ADAP, Grants from New freedom (Accessible Vans in Mobile), Getting your Child to the Doctor - Alabama medicaid's Non Emergency Transportation (NET) Program, Asking for Modifications in Housing, miss Indian Alabama 2010, The 2010 Census: Make Sure you are Counted! ﻿November 2009 ﻿Stories include:A New Social Security Project for ADAP: A Look at Representative Payees in Alabama, What the Susan J. Settlement means to you, Alabama Foster and Adoptive Parent Association (AFAPA), Why are there so many Protection and Advocacy agencies?, Amy Roloff, A Quick Look at...Stigmatizing Youth with Emotional and Behavioral Challenges and their Caregivers, Bullying, Access and Visitation Rights of Residents o Nursing Facilities, Survey Monkey: on-going survey for your ideas. ﻿September 2009﻿ Stories include: Waiting List Case Settled, Investigation Spurs Closing of Uninhabitable Dorms at DYS Facility, State MI Facilities to go Tobacco Free, What is a Guardian Ad Litem?, Private Businesses and the Americans with Disabilities Act, Who Has "Special Needs"?, Children's Advocacy Team Priorities for 2009-2011, Transition - A Trouble Spot for Alabama Youth?, Mental Health needs of Low-Income Children, Community Advocacy Team Priorities for 2009-2011, What's new for the Community Access Team for the upcoming year?, Annual Transition Goals are Back. July 2009 Stories include: No More "R" Word, ADAP Survey: We Need to hear from you!, Bryce Hospital Property for Sale, Historic Bryce Hospital Fact Sheet, Bryce Hospital Project Report available online, New Legislation Introduced to restore parent right to expert witness fees bill will ensure meaningful rights to due process and protect children with disabilities, University of Alabama sponsoring conference on Attention Deficit/Hyperactivity Disorder, Voters with Disabilities, The Department of Mental Health local planning meetings, ADAP calls for Restrictions on Seclusion and restraint in Schools, An Assistive Technology Resource for Alabama, Rotors, Wings & Wheels (RWW) is for you, Accessibility Issues at High School Football Stadiums, SSA's Hiring Plans for 2009, Birmingham City Council's Miriam Witherspoon dies. December 2007 Stories include: From the desk of Ellen B. Gillespie, Ticket to Work and Work Incentives, Getting OUT to Vote, Disability Training to Law Enforcement, ADAP Annual Priorities and Objectives for Fiscal Year 2008, Community Access Team, Children's Advocacy Team, Advocacy Assistance for Incarcerated Inmates, "In An Instant" - Bob Woodruff's Story of TBI, Autism: A Challenge for Our Schools, "Not in my Backyard" NIMBY Issues. ﻿August 2007﻿ Stories include: State to Pilot Consumer-Directed Care in West Alabama, National Disability Rights Network Urges Congress to Pass ADA Restoration Act, Disability Resources, What is the Ticket Program?, Calendar, Full Life Ahead Foundation "Helping Other People Envision", 2007 National Respite Conference, Preparedness for All: Addressing the Needs of People with Disabilities and the Elderly in Emergencies & Disasters, Alabama State of the State in TBI Annual Conference, Disability History, ADAP News, Advisory Council News, Changes in Federal and State Special Education Law: Will They Affect Your Child?, "We'll Take the Lead Now: Partners with a Twist" Newly restructured Partners in Policy Making Puts Self-Advocates in the Lead. November 2006 Stories include: ADAP Celebrates 30th Anniversary, Charles Priest, Wills, Guardianships and Power of Attorney, Insurance, Employment, Medicare and Medicaid, Return to Work, Immigration, Debtor/Creditor Issues, Other Rights Violations, EEOC Reminds SSA that Equal Access to Restrooms is Essential to all Employees, Medicaid Teach-In, ADAP's Priorities, Children's Advocacy Team, Community Access Team, How healthy are people with disabilities in your state?, Landmark Case Prompts Change in Federal Food Stamp Policy for People with Disabilities, Hotline for Air Travelers with Disabilities, 2006 National Inclusive Schools Week to Focus on Transition Planning, ADA Accessibility Issues in Public Schools, Wal-Mart $4 Generic Prescription Program, Hurricane Katrina: One Year Later, Amanda Hathcock, Priscilla Fountain, New Disability Determination Process, Private Schools and the Individuals with Disabilities Education Act of 2004 (IDEA 2004), Child Find: Evaluation & Eligibility, A Services Plan: "IEP's, Due Process Protections. July 2006 Stories include:Conspiracy of Good People, 30 Years of Disability Advocacy, From the desk of Ellen B. Gillespie, Some Linden Neighbors say "NIMBY" to Group Home, ADAP Recruiting Americorps"VISTA" Workers for Housing Initiative, New Social Security Disability Determination Process, Katrina Aid Today - An Update, STAR IS SHINING BRIGHTER, June Primary Reveals Access Problems ADAP Working on Compliance With Voting Laws. April 2006 Stories include: Scott Renner, From the desk of Ellen B. Gillespie, Avoiding Pitfalls with your P.A.S.S., Outstanding Student, Advocates Speak Out on Waiting List Suit, Dr. Seuss Meets ADAP, ADAP Focus on Recreation, Katrina Aid Today, ADAP 2006 Social Work Interns. December 2005 Stories include: A Light On The Dark Truth, Transportation at ADAP,or What in the World is JARC?, From the desk of Ellen B. Gillespie, Katrina, Transition to Adult Living, Consumer Guide Available, No Olmstead Plan All Bets Are Off !, ADAP Students, Criminal Justice Issues, Supreme Court Decides Special Education Case, ADAP's Priorities, Partners In Policymaking, My 8 months in Partners In Policymaking of Alabama. September 2005 Stories include:Transition planning for youth with Disabilities, Focus on the Student!, From the desk of Ellen B. Gillespie, Ph.D., Transition planning for youth with disabilities, Preparation: lay the groundwork, Stay on it: mentoring & monitoring, Take it to the next level, A sound judgment, Room for improvement Americans with Disabilities Act has made a difference, but some say more is needed, Room for improvement ADA, A sound judgment, Children with Multiple Needs, Who is a "Multiple Needs Child? ", Local and State Children's Services Facilitation Teams, Referring a Child to the local Multi-needs team, Continuation of Benefits for Persons in Vocational Rehabilitation Programs, Riley Signs ASL Bill, County schools told they violate federal act, Hope for kids who can't take pills and capsules, Alabama Disabilities Advocacy Program Staff Members, Children's Advocacy Team Goals & Priorities, Community Access Team Goals & Priorities. ﻿March 2005 Stories include: Lawyers disagreeon R.C. status State, foster children's attorneys file opposing briefs, ADAP's Advisory Councils, ADAP's Programs, Ellen Gillespie, IDEA 2004 Reauthorization, Children's Health Act of 2000 Seclusion and Restraint Reporting Requirements, New International Career Publication Available Online for People with Disabilities, Too many of our kids growing up in foster care. October 2004 Stories include: : IDEA Reauthorization Action Anticipated for Lame Duck Congress in November, Upcoming Learning Opportunities, ADAP Receives Strong Bill of Health From ADD, From the desk of Ellen B. Gillespie, Ph.D., ADAP Adopts Goals and Priorities for 2004-2005, Community Access Team, Children's Advocacy Team, Contacting your Representatives, Alabama Federal Contacts, Employment Rights of People with Intellectual Disabilities, Transition Training in the Black Belt Joint Effort between Full Life Ahead and ADAP, Alabama Governor's Youth Leadership Forum, Employment Rights, Transition - More Important Than Ever, Partners in Policymaking of Alabama, Partners in Policymaking of Alabama Class of 2005 Application. July 2004 Stories include: Wyatt v. Stickney: A Landmark Decision, Institutions as Dumping Grounds, Ricky Wyatt, The Theories of the Time, Wyatt's Goals, Living Conditions in State Institutions, The Decision, Angie Allen ADAP Athlete, "Folks in the mental institution have a "right" to adequate treatment", Stairway to Justice, Bottom-up reform, R.C. paves way for reform of state's child welfare system, ADAP Intern receives Honorable Mention on the USA Today All-USA College Academic Team, A Community Placement Success Story, Inclusive Dance - What a Show!, ADAP Services for Social Security Beneficiaries Who Want to Return to Work.